Changing out nozzles is fast and easy with the Senninger Hand-Tight Nozzles for their 20 - 50 Series impact sprinklers. The one piece nozzle and vane design replaces the old three part assembly eliminating the risk of losing pieces while out in the field. No tools needed. Remove old nozzle, insert Hand-Tight nozzle into barrel, just a few quick turns and your done! 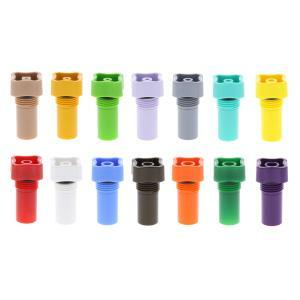 Nozzles are color coded for easy identification. Excellent durability and precision. See attached specifications for nozzle orifice size in inches. Five year warranty on maintaining correct orifice size.